I planned to activate a “border summit” (one that has two SOTA references in different associations) and one that should have been an easy summit, so that my wife and dog could accompany me. As it turned out this became a solo effort. I was determined to bag that border summit and start my entry into the 10 metre challenge by activating on 10m. I think in the end I really earned the few points these summit brought, as you will read below in my activation report. I decided upon the usual FT817, 6 metre mast and Aerial-51 antenna (no amplifier used – but actually carried on this trip, but didn’t unpack it as the amp doesn’t cover 10m). I always recharge batteries and re-pack equipment after an activation, so everything was ready to go. The location of Falkenstein is quite close to Eisenberg, which I managed to activate after a couple of aborted attempts. On the map, it looks quite simple – turn off onto Konig Ludwig weg just before entering Pfronten. Well at the roundabout before the road to Pfronten, there was a clear sign to Falkenstein. Great! However that was the ONLY sign and the road I was looking for, although shown on the map as Konig Ludwig weg, has in fact another name. After driving past the road into Pfronten, expecting to find further signs (there were none), I back-tracked and took the road that I thought it MUST be. For others looking for this road, it goes into a suburb of Pfronten called Meilingen (and is signposted to there). If, like I, you end up in the middle of the village, simply keep taking roads that go up-hill and if you pass the “AlpenBad” you are heading in the right direction. When I came down from Falkenstein I managed to bypass the centre of the village completely. I already knew that part of the way up the road to Falkenstein I would have to wait for traffic lights on the last, single track part of the road and pay €3 for the use of the private road. They have a strange set up where the road is open for cars going up the road for 45 minutes each hour and then it’s open for 15 minutes for cars coming down. They must assume that cars travel at three times the speed coming down as going up. Unfortunately I did not have the chance to try this theory out as the road was closed! The reason being one day a year (yes wasn’t I lucky, this was the day), the local ex-servicemen clubs hold a service at a memorial to fallen soldiers that is near the top of Falkenstein and there is only limited parking. So those attending the service were couriered up and back down in a minibus belonging to the Red Cross. Kindly they offered me a lift up as well but as the last bus down would be at 12 noon, I would have to walk down (which turned out fine, walking up with all the radio gear, food and water would have been pretty hard). OK, so when I arrived at the memorial, I had probably another 25 or so vertical metres to struggle up to the ruins of the Falkenstein castle. This is the highest ruined castle in Bavaria and had been bought with the intention of being rebuilt á la Neuschwanstein style by Konig Ludwig of Bavaria before his suspicious death. So it stayed a ruin and someone built a very posh and expensive hotel below it. On the day I was there the hotel had a Ferrari, a Mercedes, a Porsche and an Audi R8 parked in the car park. The weather forecast was for some showers, but luckily none came. At my first summit DL/AL-167 Falkenstein. I set up at the back of the ruins where I just managed to fit the inverted-V antenna in. I started on 10 metres, and found to my horror an S9 signal warbling all over the bottom half of the band. It sounded like an instable signal generator with a large amplifier attached. It was not radar like. I was a real problem though. There was a couple of other activators who had spotted activations on 10m. I took a listen – no chance. I then moved up the band far enough to miss the worst of the interference and put out a call but then I had all kinds of problems with Radio Rucksack Tool complaining about errors in XLS files and shutting down. I found the problem later, it was that I did not have any Internet credit left on my phone and it seems the RRT reacts strangely when it can’t get Internet access. In any case, the self-spot on 10m did not help so, I decided to move to 20m where I managed a few contacts. I also took a look on 40m but there was some contest on meaning I could not find a free frequency. I made enough contacts to qualify the summit in any case. As time was pressing on and I could see the next summit in the distance at the top of a pretty craggy climb, I decided if I was going to manage my “border summit”, I would need to pack up and head off, With having to walk back down the mountain a ways and then climb up the other side, I estimated it would take me an hour – it took nearer to an hour and a quarter. Again sign-posting did not help at all. There was no reference to Zwolferkopf or Einerkopf that comes before it, on any of the walking track signs, so I “plumpted” for the one that I hoped was correct. For future reference, the track starts at the Austrian border stone shown in my pictures below just off the road up to Falkensten – about 2/3 of the way up from the start of the private, single track, traffic light controlled section. It was certainly a long climb up to Zwolferkopf, but you certainly knew you were above everything else once you got to the top, where two seating banks are located alongside the track. The track doubles as the German and Austrian border marker. 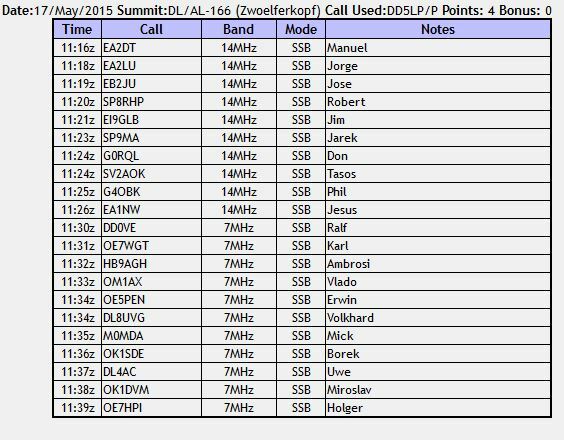 Once set-up I called first in Austria using my Australian callsign – OE/VK2JI/P (when I am outside of Germany, I dont have to use my German call, I can also use either my Australian or English call sign). This was Zwolferkopf defined in SOTA as OE/TI-670. 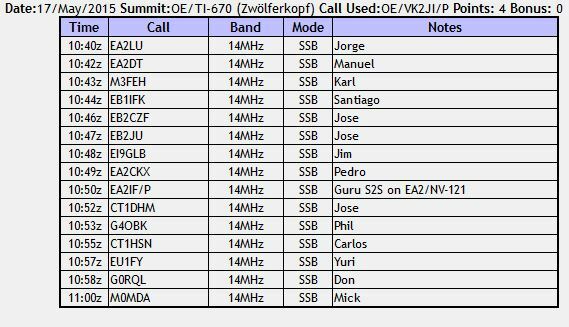 Although 10m was again a wash out with the Interference, I made a good selection of contacts on 20m including a S2S with Guru EA2IF/P on EA2/NV-121. I think using the VK call helped somewhat in the number of chasers calling. After grabbing some lunch, I then activated as DD5LP/P from DL/AL-166 (still Zwolferkopf). This time the number of contacts were less, so I decided to try 40m and managed a few more contacts there. As usually happens, once I had packedd up a couple more activator spots came through that I might have been able to work, but with everything packed away ready for the climb back down the hill, I couldn’t unpack everything again. The walk down to the road went quite quickly but the walk from there down to the car park was some distance, leaving some blisters on my feet. All in all an exhausting but successful day! Aerial-51 model 404-UL asymetric dipole. I have been unable to find what caused the horrible inteference on 10m near Falkenstein and Zwolferkopf however I’m sure it is local and would suspect something within the hotel, a plasma TV possibly. I really do need to cut down my equipment to one rucksack from the current rucksack plus camera bag and if I decide that I don’t need the amplifier, take it and it’s 2 5aH LIPO batteries out of my pack! I’m not fit – I need to get out some more. It was a real achievement to get to the top of Zwolferkopf but I shouldn’t have been panting so much when I got there and there were few points where I almost twisted my (weak) ankles. Definitely more exercise is called for! This entry was posted in SOTA and tagged DL/AL-166, DL/AL-167, Falkenstein, OE/TI-670, SOTA, Zwolferberg by VK2JI DD5LP G8GLM. Bookmark the permalink.